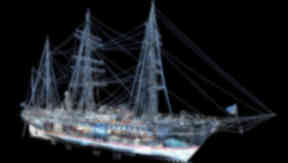 Dundee's RRS Discovery has undergone a 3D scan to produce images that will show movement of vessel. Dundee tourist attraction RRS Discovery is most famed for carrying some of history's greatest explorers across the iceberg-laden Antarctic. But this week the famous ship took on its first digital expedition without even leaving dock. A 3D laser scan of the 113-year-old vessel, which is part of the UK's historic fleet collection, has produced imagery which will be used to help maintain it. Dundee Heritage Trust (DHT) took the opportunity to carry out the work while the boat is in dry dock in preparation for the city's waterfront development. Digital Surveys have been carrying out this work which will result in a photo realistic 3D model of the external hull, top deck and masts, a printed model of the ship and an online web-based virtual tour. But essentially the scan will identify any deformation or movement of the ship and be a significant piece of baseline information for future conservation monitoring and management purposes. It will also inform possible future engineering proposals regarding the cars and presentation of the ship. Mark Munsie, operations director from DHT, said: "RRS Discovery is showing signs of structural movement which is evidence in the form of cracks opening between timbers at various locations around the ship. Ben Bennett, chief technology officer from Digital Surveys, added: "Digital Surveys are delighted to be working on such a prestigious heritage project. We will be using the latest 3D laser scanning technology to digital capture the vessel creating a virtual snapshot in time.